That's the newest ornament on our little Christmas Tree. And guess who wanted it? Clue...not the little one. LOL! Well, she actually likes it but she didn't ask for it. Daddy was the one who thought it's a good idea to get it for her. Like I need more 'reminders' that it's almost Christmas. It used to be that she only says the days left before Christmas. 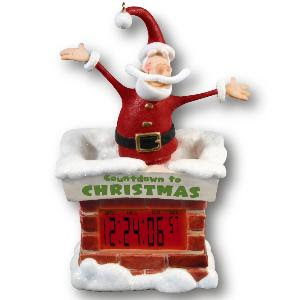 With this counter, she now tells me how many days, hours, minutes & seconds left before Christmas...and she reminds me at least 5 times throughout the day. Lovely, eh?